Prof Ratnam V Rajakumar was born in Chinnapuram (Machilipatnam), India. 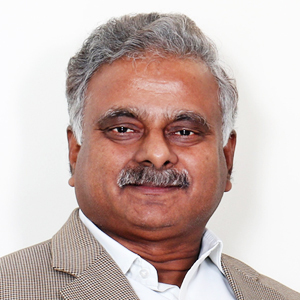 He received his BE degree jointly topping all branches of engineering in 1980 from Andhra University, Visakhapatnam, MTech and PhD degrees in 1982 and 1987 respectively from IIT Kharagpur, all in Electronics and Communication Engineering. He has been serving as a professor of Electronics and Communications engineering at IIT Kharagpur, starting his career as a member of the faculty at an early age in 1984. He is presently serving as the Director of IIT Bhubaneswar and engaged in directing it find its place amongst the global class. Earlier from 2010-15, he has served as the first Vice-chancellor of Rajiv Gandhi University of Knowledge Technologies (RGUKT), Hyderabad, met the challenges of building this new University into a model for quality Engineering education and helped in realizing the university and its dream, despite its challenging and unparalleled annual intake of 6000 rural students, through several innovations, raising of quality faculty and by creating world class laboratories. The university won awards for its innovative ICT based education and pedagogical systems created under his leadership. He has also served as the Dean of Academic Affairs of IIT Kharagpur from 2003 to 2006, as the Chairman of the G S Sanyal School of Telecommunications, a school of excellence for research in Telecommunications till 2005 and headed the Vodafone Essar - IIT Center of Excellence in Telecommunications from 2007 to 2010, besides other assignments. He made perspective plans for the growth of IITs at Bhuabneswar and Kharagpur and also was responsible in bringing important academic reforms in academics at these institutions. He has also served at the University of Michigan, Ann Arbor in 1988 on a visiting assignment. He has also been serving on the governing boards, advisory boards and national committees of numerous reputed institutes, organizations and government departments and has been helping in providing active guidance and sharing of vision. He was also instrumental in the initiation of the INDEST Consortium. His areas of research interest include Digital Signal Processing, Wireless Communications, Detection and Estimation and VLSI systems for Communications. He has over 160 research publications in reputed international journals and conferences and has supervised the theses of over 140 students at different levels. He has authored video courses in engineering, a couple of which were also telecasted nationwide. He is presently engaged in active research on Green radio, Cognitive radio and GLRT based detection systems. Education in general and Technical education in particular is also of his interest, he made very significant contributions to the same, served on the boards of studies of several institutions and contributed in curricular design exercises. Prof. Raja Kumar made significant contributions to technology development through prestigious national projects. Designing a sonar homing system for the first ever torpedo developed by India, designing communication systems for defense systems and taking the first steps for the development of Cognitive Radio by DRDO, are a few of the many similar contributions made by him. The BOYS-CAST research grant from the Department of Science and Technology, Government of India in 1987, the Baroda Chapter national award of ISTE in 2007 and the best student paper award in the 1984 IEEE Region 10 (Asia & Pacific) Graduate Paper Contest are a few of the numerous awards and distinctions held by him. He was an active member of the prestigious academic delegation accompanying hon'ble President of India on his state visit to China from 24th to 27th May 2016. He was also instrumental in organizing several National and International Conferences serving as general chair, TPC chair and various Committees.